« String Cheese Incident – New Years Eve 2012-2013! Jomeokee was a special experience. Set in the rolling hills of Pinnacle, North Carolina, festival-goers were treated to a unique and eclectic blend of bluegrass, jazz, funk, roots, reggae, and much more, all with the stunning backdrop of Pilot Mountain State Park. I find it comforting that, in an age of ever-advancing technology, one can still experience a weekend of music so rooted in tradition. 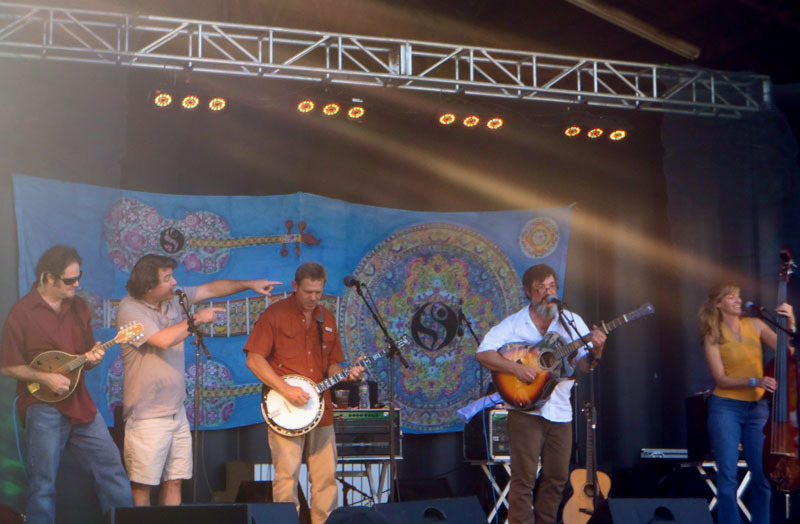 Other Jomeokee festiv-ees certainly would agree, as the atmosphere immediately took on one of excitement and curiosity, with most band-members quickly adopting the name “Jam-eokee” to describe the experience. This is precisely was Jomeokee was: an incessant flow of rootsy improvisation. Formed in New Orleans in 2003 (and now located in Nashville, TN), the Captain Midnight Band is truly an experience unto itself. 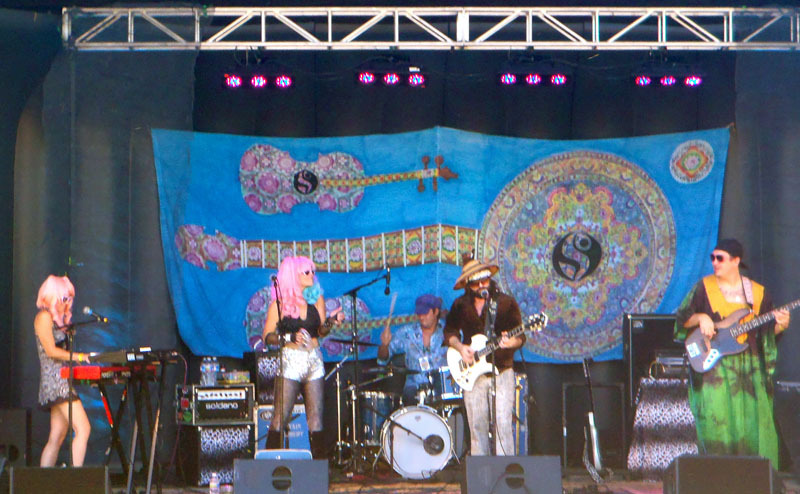 Self described as “Water bed rock & roll for the mind, body, and soul,” this is an extremely talented group of musicians who take “funky” to a new level. These guys (and girls) started the weekend off with some great originals and a captivating take on the Dead’s “Help On the Way>Slipknot.” If you haven’t heard or seen them yet, please do your ears a favor and look them up. Comprised by The String Cheese Incident’s Bill Nershi and Leftover Salmon’s Drew Emmitt, this band is overflowing with talent. Holding down the upright bass is Johnny Grubb who formerly played with Railroad Earth. Bringing the band full circle on banjo is Andy Thorn, an extremely gifted young musician from Durham, North Carolina, that us younger folks should be especially proud of. Emmitt-Nershi’s set was a fantastic mix of traditional bluegrass. Fans were especially roused when a few String Cheese covers were thrown out (Colorado Bluebird Sky, Good Times Around the Bend), which sounded excellent coming from this lineup. We were able to catch these gentlemen in Chattanooga, TN the week prior, and it’s entirely too refreshing to observe musicians of this magnitude who truly enjoy connecting with their fans on a personal level. They treated Jomeokee-ans to an incredible set of fun music. Both Bill and Drew will be returning to their respective bands later this fall, but there’s still time to catch them before the world ends. This amazing set of music was followed by Yonder’s second night of entertaining fans. I personally wondered if it would get overshadowed by anticipation for the Everyone Orchestra jam, which was filling up quickly as Yonder’s set came to a close. I was quickly proven wrong. Yonder brought out guest after guest for this memorable bluegrass experience. They guys from YMSB did a gracious job of harnessing their own sound whilst allowing respective guests to offer their own blend to the experience. Some folks truly do not understand what this type of music scene is all about, and wonder why people of all shapes, sizes, and backgrounds come flocking from afar to these so-called music festivals packed with weird odors and strange food items. For those in question, I’d recommend asking Matt Butler. A humble and unimposing individual when encountered at close range, this multi-instrumentalist and conductor has improvisation running through his veins. He arguably represents what this expansive music scene set out to accomplish, beginning in the early 1960’s with young individuals like Mr. Jerome Garcia and Ken Kesey. The intent is far from a band getting on stage and simply performing. Instead, it’s about the circular and countercurrent flow of energy between and amongst the audience and musicians on stage. When this is accomplished, magic happens, which is why so many of these bands have succeeded in drawing loyal followers to performances around the country. I digress, back to Matt Butler and the Jam-eokee incarnation of the Everyone Orchestra. Earlier in the day, Butler had led a small audience in rhythm on the “Lester Flatts” stage, along with Jeff Sipe, Andy Thorn, and several other musicians who came and went in Everyone Orchestra fashion. This was a special, intimate preparation for what was to come. As the Bluegrass Jam concluded Saturday evening, expectations and excitement grew pungent throughout the crowd. I personally couldn’t wait to hear Michael Kang and Jimmy Herring trading guitar licks, among the other legends upon stage. These events are 100% improvisational, with the conductor and respective musicians relying solely on their knowledge of music theory to guide them through the ebb and flow of Butler’s conduction. The stage literally seeped with talent, so it was simply a matter of waiting for these jams to build into the mind-warping vehicles they’d become. Immediately evident were the different styles of playing. The sounds of moe. trickled out from Al Schnier’s spacey riffs, while George Porter Jr.’s firm bass lines established solid grooves throughout. 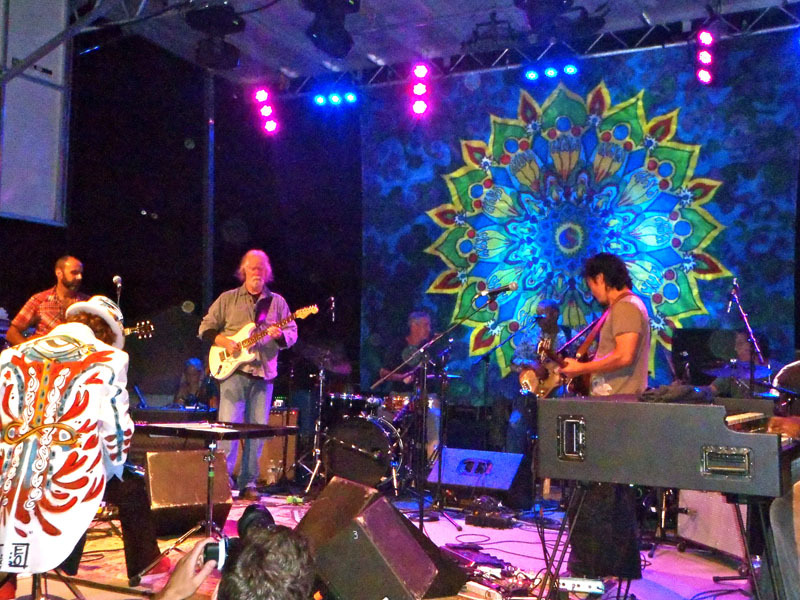 Jimmy Herring was set up on the left next to drummer Jeff Sipe, who unremittingly explored the schizophrenia of “drum space” throughout the performance. Michael Kang was set up on the right next to Melvin Seals, who merrily pounded out the funkily familiar sounds of his tenure with the Jerry Garcia Band. As the show whorled onward, we were all fortunate to observe some magical acts of improvisation. Jimmy Herring permeated an immediate viscous drag with his aesthetic sounds of jazz-fusion, an unmistakable sound to fans of his style. Michael Kang produced equally melodic riffs from his familiar electric mandolin sound, truly taking things to another level. I was most impressed with the way Herring and Kang worked off each other. While Jimmy can seemingly play a hundred notes in a milli-second, Kang complimented this quickness with patience in building the jams. Butler obviously caught on and took hold of these powers, taking audience members on a memorable ride for the second half of the performance. This in mind, we mustn’t forget Jennifer Hartswick belting out world-class vocals from the left side of the stage, and members of Lettuce keeping things extra funky. It’d be impossible to place this musical happening under a category or genre, which is exactly the point. The audience played a huge role in flow make-up as well, singing choruses and cheering on Butler’s request. It’s tough to put this performance into words, as with all great musical moments. I think what everyone can and should take away from this weekend is that magical, interactive music is still out there being co-created amongst audiences and musicians, and that it doesn’t always have to be musicians on stage while crowds mindlessly boogie down and sing along.